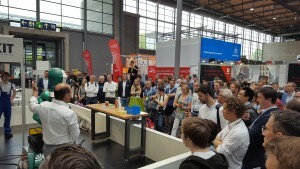 The SecondHands stand attracted a lot of interest from visitors and the local media. The team at KIT performed more than 50 demonstrations of the SecondHands robot, ARMAR-6, helping a human technician in doing maintenance work of Ocado’s highly automated warehouses (Customer Fulfillment Centre). The SecondHands project team demonstrated the humanoid robot ARMAR-6 collaborating with a human worker in a bimanual overhead task and performing force-based bimanual manipulation, vision-based grasping, fluent object handover, human activity recognition, natural language based human-robot dialog and interaction, navigation among many other features. The use case shown in the demonstrations was supplied by Ocado. In a complex maintenance task demonstration, the robot was able to recognise the need of help of a technician based on speech, force and visual information. 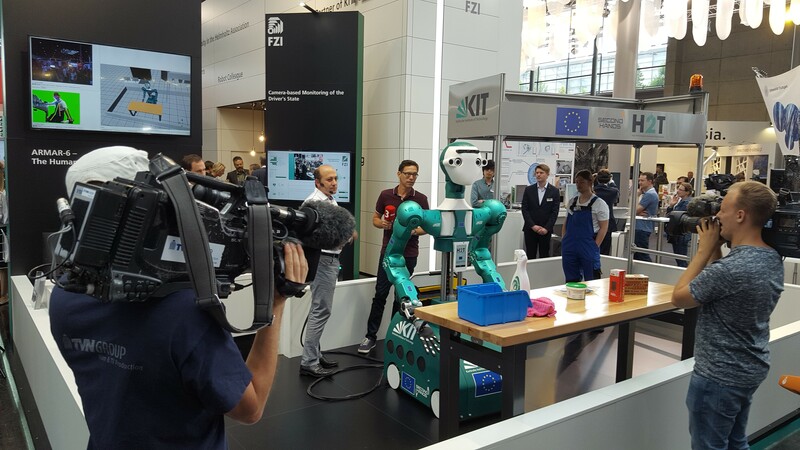 The demonstrations were filmed by national and international televisions and was ranked as one of the top CeBIT 2018 highlights. The CeBIT exhibition is one of the largest and most representative technological exhibitions in the world. It covers hot topics and trends in digital technology such as AI, robotics, Internet of Things and big data among others. It covers the digitisation of business, government and society from every angle. In 2017, more than 200,000 people attended CeBIT. Other press resources on the exhibition are available at this and this link in German.